Kalamazoo, MI October 19, 2017 – The Kalamazoo Symphony Orchestra is proud to present the first concert in its 2017-18 Zhang Financial Pops! Series, Grammy Award Winning pop and R&B group, All-4-One. This California based quartet, are not only one of the most sensational and timeless groups of the 1990’s, they have sold more than 20 million records worldwide and their success has spanned two decades. The evening’s program will be announced from stage. Highlights of Daniel's 2017-18 season include two live movies (Star Wars: A New Hope and A Jungle Book), three performances of The Nutcracker, and his Kalamazoo Symphony Orchestra Symphonic Series debut featuring Tchaikovsky's “Pathétique" and collaborations with violinist Jennifer Frautschi and Pulitzer Prize winning composer George Walker. Daniel Brier received his musical training at the University of Michigan’s renowned conducting program earning degrees in orchestral conducting with Kenneth Kiesler and choral conducting with Dr. Jerry Blackstone. While at the University of Michigan, he served as an assistant conductor for the world premiere recording of Milhaud’s L’Orestie d'Eschyle conducted by Kenneth Kiesler. Recorded live on Naxos, the album earned a GRAMMY® nomination in 2015. He is a recipient of the Julian and Vera McIntosh scholarship for promising young musicians and conductors, the Dr. Charlene Archibeque scholarship for choral conductors, and the Dorothy Greenwald scholarship. If you’ve ever been in love, then you’ve heard the name All-4-One and their timeless songs “I Swear”, “I Can Love You Like That”, “So Much In Love”, “I Turn To You”, “These Arms”, “Beautiful As You” and much more. The Grammy Award Winning group All-4-One is internationally known for making beautiful love songs that not only chart radio airwaves, but also garner countless awards. All-4-One’s very first single “So Much In Love“, scaled to RIAA Gold Sales and top 5 pop status. The California based quartet soon marked their place in the industry as premier balladeers. Their second single, “I Swear”, claimed the billboard “Hot 100” #1 spot for 11 consecutive weeks, while sales sky rocketed to hold the #1 selling single status in 1994 and third most successful single of the rock era. “I Swear” still holds a spot on Billboard’s “Hot 100”as one of the most successful singles of all time and has been named by ASCAP as one of the greatest love songs of the 20th Century. “I Swear” is recorded in history with an imprint in the Guinness’s World Book of records (as the biggest selling single of 1994). The groups second album was highlighted by “I Can Love You Like That”, a mid-tempo which hit the top 5 on the Billboard “Hot 100”. To date they have released a total of seven albums and sold over 20 million units worldwide, won a bevy of awards including a Grammy, an American Music Award, a Blockbuster Award, countless international awards and completed multiple major world tours. 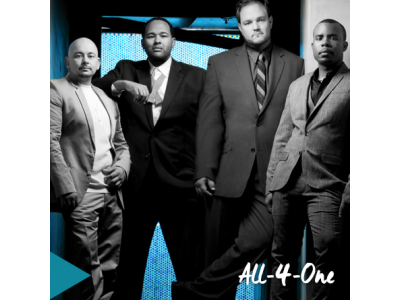 In celebration a two-decade career milestone, All-4-One released their best album yet with Twenty+ on July 24, 2015. Twenty+ includes 14 new songs and 6 of the groups biggest hits that helped propel them to international success. In addition, All-4-One’s music continues to gain more popularity with placements in commercials, worldwide music compilations, TV shows and major motion pictures such as Sisters, Despicable Me, Earth To Echo, the hilarious Ryan Reynolds comedy Just Friends, The Social Network and Nothing To Lose. The group’s contribution to soundtracks include: the multi-platinum soundtrack to Walt Disney Pictures animated feature film, The Hunchback of Notre Dame with the title song “Someday”, and the Space Jam Soundtrack, a 5-time platinum album with “I Turn To You”. The California based quartet, All-4-One, continues to tour the world and record new music as the original members with a collection of timeless hit songs under their belt. Twenty+ is available on iTunes and Amazon now.